This morning at the European Physics Society conference in Stockholm, the LHCb experiment operating at the Large Hadron Collider (LHC) CERN brought one more argument to put to rest a long-standing discrepancy that had kept theorists puzzled for nearly two decades. LHCb presented the most precise measurement to date of the b baryon lifetime. A baryon is a family of composite particles made of three quarks. For example, protons and neutrons are made of a combination of u and d quarks. What makes b baryons so special is that they contain a b quark, a much heavier type of quark. Composite particles containing b quarks like B mesons (made of a b and either a u or d quarks) and b baryons are unstable, meaning they have a short lifetime. About one picosecond after being created, they break down into smaller particles. In theory, both B mesons and b baryons should have approximately the same lifetime. But in the 1990’s, when CERN operated with its previous accelerator called LEP (Large Electron Positron collider), all experiments measured a systematically shorter lifetime for b baryons than B mesons as can be seen on the plot below. 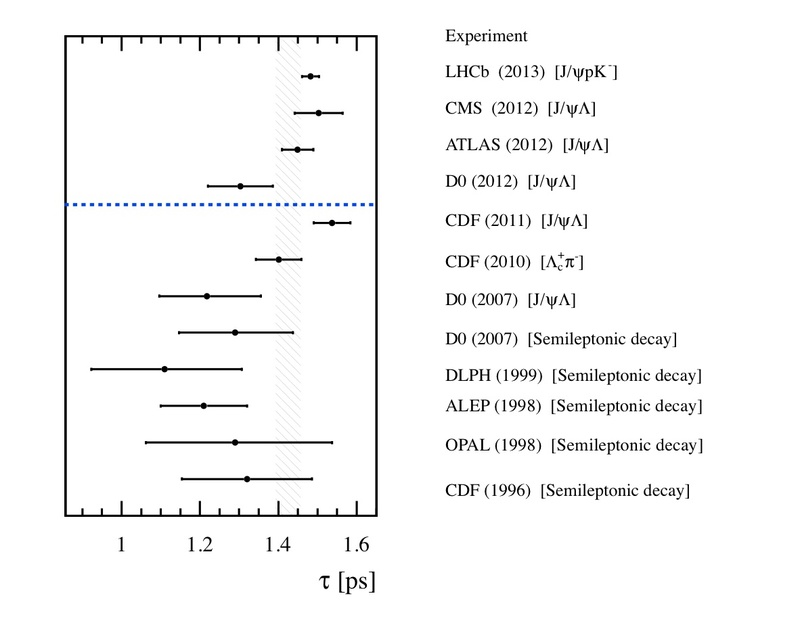 Although the LEP experimental errors were quite large, the general trend of lower values was very puzzling since all four experiments (ALEPH, DELPHI, OPAL and L3) were working independently. The various b baryon lifetime measurements over time from the oldest results at the bottom to the three latest results from the LHC experiments at the top. The measured value has now shifted toward a value of 1.5 picoseconds, as measured for the B mesons. This prompted theorists to re-examine their calculations and to look for overlooked effects that could explain the difference. Despite all efforts, it was nearly impossible to reconcile the measured b baryon lifetime (somewhere between 1.1 to 1.3 picosecond) with the B meson lifetime at around 1.5 ps. Nearly a decade later, D0 and CDF, the two experiments from another accelerator, the Tevatron near Chicago, started closing the gap. It took another decade for the LHC experiments to show that in fact, there is no large difference between b baryon and B meson lifetimes. Already, earlier this year, ATLAS and CMS both reported values in line with the B meson lifetime. With this latest and most precise result from the LHCb experiment, there is now enough evidence to close the case on this two-decade-old discrepancy. LHCb measured the b baryon lifetime to be 1.482 ± 0.018 ± 0.012 ps. Hence, both lifetimes are now measured close to 1.5 picosecond and LHCb calculated their ratio to be 0.976 ± 0.012 ± 0.006, very close to unity as theoretically expected. One possible explanation is that all LEP experiments were affected by a common but unknown systematic shift or simply, some statistical fluctuation (i.e. bad luck). The exact cause might never be found but at least, the problem is solved. This is a great achievement for theorists who can now rest assured that their calculations were right after all.